Boldt Castle is a major landmark and tourist attraction in the Thousand Islands region of the U.S. state of New York. Open to guests seasonally between mid May and mid October, it is located on Heart Island in the Saint Lawrence River. Heart Island is part of the Town of Alexandria, in Jefferson County. Originally a private mansion built by American millionaire George Boldt, it is today maintained by the Thousand Islands Bridge Authority as a tourist attraction. George Boldt, general manager of the Waldorf-Astoria Hotel in New York City and manager of the Bellevue-Stratford Hotel in Philadelphia, and his family enjoyed an earlier frame cottage on Hart Island (the island's original name) for several summers, which they greatly expanded. In 1900, George Boldt launched an ambitious construction campaign to build a huge masonry structure, one of the largest private homes in the United States. He engaged the architectural firm G. W. & W. D. Hewitt and hundreds of workers for a six-story "castle" as a present to his wife. In addition, four other masonry structures on the island are architecturally notable. Equally distinctive is a huge yacht house on neighboring Wellesley Island, where the Boldts had another summer home and a vast estate, incorporating farms, canals, a golf course, tennis courts, stables, and a polo field. The construction of Boldt Castle ceased abruptly in early 1904 after the death of Boldt's wife, Louise Kehrer Boldt. Boldt never returned to Heart Island, leaving this structure as a monument of his love. For 73 years, the castle and other stone structures were left exposed to the harsh winter weather and occasional vandals. The Thousand Islands Bridge Authority acquired Heart Island and the nearby yacht house in 1977, for one dollar, under the agreement that all revenues obtained from the castle operation would be applied towards restoration, so that the island would be preserved for the enjoyment of future generations. In the two decades after acquiring the property, the Thousand Islands Bridge Authority spent some $15 million for restoration and improvements here, and work continues annually. The initial goal of the restoration of Heart Island was not to finish what had not been completed, but to restore the island to the state it was in when construction was halted. Improvements have gone beyond that stage, however; a stained glass dome, marble floor, and grand staircase woodwork, for instance, now seen in the main hall, were not original but are modern innovations. Today, Boldt Castle is accessible by ferry, private boat or by tour boat from Alexandria Bay, New York Clayton, New York, Gananoque, Ontario, Rockport, Ontario, and Ivy Lea, Ontario. Most of the grounds and buildings can be explored by the public for a fee. The boat-owning public may also dock at Heart Island for free. There is a U.S. Customs and Border Protection office (wood structure manned by single customs officer) on Heart Island and visitors coming from Canada require appropriate identification, as visiting the island is considered entering the United States. Most of the rooms on the first floor and many of the rooms on the second floor of Boldt Castle are furnished as of 2011[update], but mostly with modern pieces. The basement is mostly unfinished, with a pool, bowling lanes, many compartments, and a long passage to the Power House. Most of the rooms from the second floor to the top floor have been left unfurnished, but there are exhibits in some of these rooms and hallways showing pictures and artifacts of the Thousand Islands region during the era in which the Boldts lived. These rooms are also left unfurnished to give the visitor an opportunity to imagine what the castle looked like before modern improvement. At the edge of the island, a monument stone triumphal arch, originally intended by George Boldt to be the entrance way for boats, has been fully restored. The bridge connecting the two sides would have been raised and lowered as required. Two other buildings on the island are the Power House and the Alster Tower; both are open to the public. The Power House was built to hold a generator to supply the island with power, and now is more of a museum of how electric power was obtained in the early 1900s, as well as a few stories of getting tools and equipment to Heart Island during the castle's construction. The Alster Tower was purposely constructed with slanting and uneven walls, ceilings, and roofs. The George C. Boldt Yacht House on nearby Wellesley Island is unique, warranting a visit by means of a shuttle boat connecting it to Heart Island. It was listed on the National Register of Historic Places in 1978. The 1969 children's novel Secret Castle by Anne Colver is about the castle and Alexandria Bay. 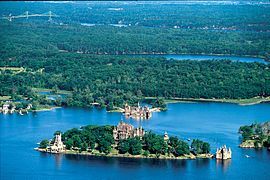 ^ "Boldt Castle (Heart Island, New York)". Buyoya.com. Retrieved 2018-04-18. ^ "Boldt Castle Visitor Info". Retrieved 2018-04-18. Lucas, Roger. Boldt Castle, Heart Island. Cheektowaga, N.Y.: Research Review Publications, 1992. Malo, Paul. Boldt Castle: In Search of the Lost Story. Fulton, N.Y.: Laurentian Press, 2001. 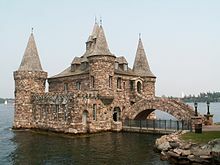 Wikimedia Commons has media related to Boldt Castle. This page was last edited on 1 February 2019, at 16:11 (UTC).